It’s official. April, 8, 2019, is now Daniel Delgadillo Day in Bridgeport. 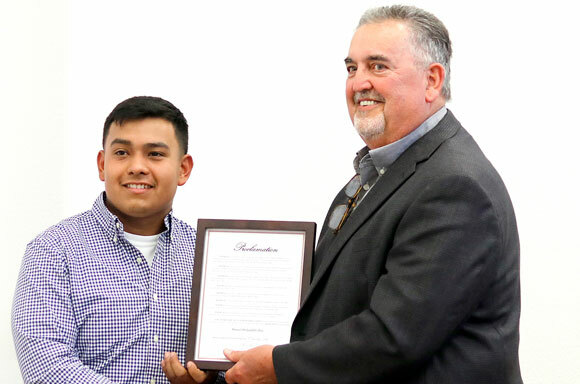 At Monday’s city council meeting, Mayor Randy Singleton issued a proclamation on behalf of the City of Bridgeport to make April 8 known as Daniel Delgadillo Day, honoring the Bridgeport High School junior for his heroic act that likely saved a fellow student’s life. In March, Delgadillo performed the Heimlich maneuver on junior Sammy Davis after Davis began to choke on a piece of meat during a school trip at the Allen Convention Center. Singleton cited statistics from the National Safety Council, which lists choking as the fourth leading cause of unintentional injury deaths in the United States. He praised Delgadillo for his quick thinking and calm execution of the maneuver in the emergency situation, adding that he and council members felt it was important to recognize the student. In a March 30 Messenger story, Delgadillo said he learned the Heimlich maneuver from his participation in the Texas Association of Future Educators. Delgadillo said when he realized Davis couldn’t breathe, he assessed the situation, walked behind Davis and hoisted him up, dislodging the hunk of meat from his friend’s throat. In addition to saving lives, Delgadillo has been known to record saves on the mound as a standout pitcher for Bridgeport. Delgadillo was named to the all-district team and was selected to play on the Sunbelt Classic all-star team following his sophomore season. After college, Delgadillo said he hopes to become a coach and educator after college. Bridgeport Principal Jamie Sturdivant said she will be more than interested in giving the student with a day named after him a shot as an educator one day, due to his heroic act and the character he’s shown in and out of the classroom. That a fine young man there!